Olivia Lantz ’19 (left) led the field to win the Maribel Sanchez Souther Invitational., completing the 6-kilometer course in 21:33.15. Fresh off of a 10th-place finish at the Boston College Coast-to-Coast Battle at Beantown at Franklin Park in Boston, Massachusetts last Friday, Olivia Lantz ’19 is off to a great start this season. Lantz completed the 5-kilometer course in 17:30 against a nationally competitive field, shaving 30 seconds from her time in the same race last year. With a win at the Maria Souther Sanchez Invitational earlier in the season at the Hanover Country Club, Lantz looks poised to contend with some of the best runners in the Ivy League and the country. How did you start running cross country and track? OL: I began running indoor track when I was an eighth grader in middle school — I was a soccer and lacrosse player, so I used track to stay in shape for those other two sports. I still continued to play soccer and lacrosse up until my sophomore year of high school, when I realized that I was better at running than my two other sports, so I decided to switch over for all three seasons. I’ve been running cross country, indoor and outdoor track ever since, and I came here to Dartmouth to continue. You’re coming off of a great performance at last week’s Boston Coast-to-Coast Invitational last week — what do you think has been the difference this season? OL: I would say that understanding how to race in a college competition has been really important for me, and it’s a lot different than high school racing, especially in cross country. 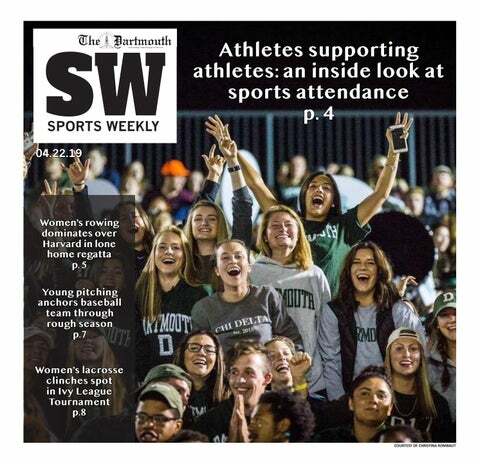 I also think I’ve learned a lot from training at Dartmouth and being surrounded by a bunch of girls who challenge me and help me to improve my fitness and overall running and strategy. With that comes confidence, and the team environment that we have really promotes confidence and makes me realize that if I want to achieve something, I can put my mind to it and go do it. I would also say that over the summer, I really committed to a lot of big mileage and stuck my nose in it training-wise. I was stuck here for sophomore summer, so training here on the Dartmouth trails is really great and I was surrounded by a couple of my other teammates which really helps. How does this help your confidence going into the rest of the season? OL: I’m really happy about the outcome of the race — I was hoping to be top-15 going into the race, so I was happy to achieve my goal. I was also happy to drop a significant amount of time off last year, and it definitely gives me a lot of confidence just to know that I am in better shape than I was last year and I feel more comfortable and in-tune with my body during races which is a good sign moving forward. One of the things I need to focus on is continuing to get more fit and sticking my nose in the competition with some of those higher-ranked girls and making sure that I give myself a chance to run with them. Is your approach to this season different than in the past now that you’re an upperclassman and have two full seasons under your belt? OL: Not drastically, but my role on the team has changed — evolved — from being on the team for three years now. I definitely feel like I play more of a leadership role as a captain on the team, so that allows me to provide guidance and advice to all of the other girls on the team. It also gives me a sense of responsibility to lead by example, which motivates me even more to dedicate time and effort to be a good example for the rest of my teammates. How was the transition from high school to collegiate running for you? OL: The transition from high school to college was definitely difficult. I don’t think there’s one college runner who would say that it was easy. Often times, it’s hard to wrap your head around the competition you had in high school and then immerse yourself in the competition you have in college and the fact that the competition in college is of such a high caliber. Being comfortable with not being that person at the front can be an adjustment at first, and even training with a bunch of other girls who are at the same level as you can still be a little bit strange because oftentimes people didn’t have that in high school. But for me, I would say that this transition was definitely hard at first, but once I embraced it and the dedication that my teammates had for the sport, it really helped to push me forward and make me better. What is your favorite part of distance running? OL: One, we’re so lucky to be in Hanover — the trails are so amazing here, and the runs are like nothing else or any other school I would’ve went to. For me, distance running is a lot more about the longer runs than the ones we actually race, and it allows you to get down to your most raw and vulnerable moments in life. Whether you’re having an amazing day or a terrible day, you still go for that 45- to hour-long run and talk with the girls on your time. Sometimes those talks are great, and sometimes those talks are terrible, but I think I’ve learned so much about myself through these long-distance runs. I’ve been able to figure out what works for me in life and what’s important to me in life, and I don’t think I’d be able to answer those questions without this sport. OL: I’m an engineering major, so I spend a lot of time doing schoolwork. I love the outdoors, so when it’s warm out, I spend a lot of time in the water and the river swimming — Mink Brook is a great place to jump in after a hot run. I’m also involved in Movement Against Violence on campus and I’m affiliated, so I spend a lot of time with my sorority too. I also have a couple of jobs on campus, so I keep my schedule full. This interview was edited and condensed for clarity and length.